Hope you got one last deep breath last week! May has arrived and did you know that the first week in May is Teacher Appreciation Week as declared by the national PTA? And Tuesday is the "unofficial national holiday" but the one most people actually celebrate! Eleanor Roosevelt assisted in getting the 81st congress to declare in 1953 a national teacher appreciation day. Until the 1980s it was celebrated in March but is now celebrated the first full week in May and specifically the first Tuesday in May. So, in honor of all our wonderful teachers, I wanted to share a few ways you might want to let them know they are appreciated! Buy the miniature candies for Smarties, $100,000 Grand, and/or Lifesavers and attach a small note that says something like: "No one is Smarter than you in meeting the needs of our students and parents!" or "Wish I could give you what you are really worth!?" Or "You are a lifesaver for our students and parents every day!" Take a picture of a flower bouquet and send it in an email with a note of thanks…in the subject line put: A virtual bouquet for a for Real Special Teacher! Bottom line is you don't have to spend a lot of money to make your teachers happy — just demonstrate in a real way that you DO appreciate them! Do you have a favorite way to say thank you to your teachers? Share it with me so we can let others know too! So, we have just about recovered from our week in St. Louis. If you called or emailed the CASE office, Robin Smith or me and didn't hear back from us, I apologize for it just falling through the cracks during that week we were out of the office! Please give us a second chance and let us hear from you! Also we really wanted to once again thank our very special sponsors during the convention! Scholastic, Inc hosted an amazing dinner for the Executive Committee; Winsor Learning provided the full breakfast to our joint member/BOD meeting with over 75 people in attendance; our afternoon break of toasted ravioli and root beer floats was sponsored by Houghton Mifflin Harcourt; The Master Teacher sponsored our lovely awards at the end of the day! On Thursday we had over 450 people attend our showcase session with Julie Weatherly providing 90 Tips in 120 Minutes sponsored by Houghton Mifflin Harcourt. CASE Night was a huge success with 190 people attending the Anheuser-Busch Brewery tour, including seeing world famous Clydesdales, dinner, and dancing sponsored by Star Autism, C8 Sciences, and viZzle! Be sure and support these companies for the great support they provide us! And go to the CASE Facebook page and look at the Photos/Albums on CEC and on CASE Night! Speaking of support... We need you to support the CEC/CASE Legislative Summit! Registration is now up and you can get other information on the dedicated webpage for the Summit! We had over 180 last year and the hotel has limited space so we need you to make your hotel reservations ASAP! With a room rate of $155 in a DC area hotel right across the street from the metro is a real deal! I personally believe EVERYONE should visit D.C. ever 5 years so why not think about extending your stay and have a family outing? Alexandria is a great location with so much to do just in walking distance of the hotel! And don't forget there is an EARLY BIRD registration open until May 11. And if you bring 3 or more, there is a great group rate after the Early Bird! Of all of the CASE events, the Legislative Summit gets both the highest marks on evaluation and highest return rate! It is also an event that is hard for the State units to replicate. Be a part of the team your state sends to advocate for special education up on the Hill this year! 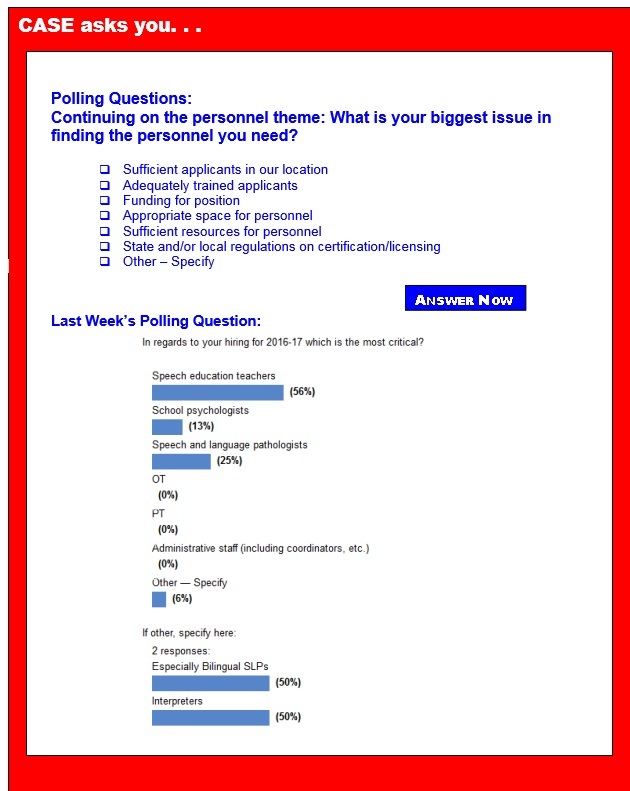 Last week's poll asked about your critical personnel needs. I want you to know I proof the article at least 4 times every week and even have two extra pairs of eyes do the same and did you notice my huge mistake in the poll? What is kind of funny is I think everyone read it as it was "supposed" to have been! The very first option was supposed to have been Special Education Teachers but instead it read Speech Education Teachers! Where was my brain??? Even with the error, first place with 56 percent was, Speech [sic] Education Teachers. In second place with 26% was Speech and Language Pathologists. Coming in third with 13 percent was school psychologists. 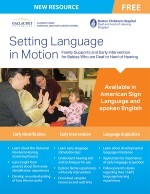 With 6 percent was the "other" category and the specified areas were bilingual SLPs and Interpreters. I can't believe I left out interpreters as that was always one of my big areas of need! Along with teachers of the deaf and hard of hearing! I used to make appointments to interview teachers at Gallaudet when I went in July for the CASE legislative visit! Hey, that is another reason you should go to the CEC/CASE Legislative Summit this year! Two different years, I hired Gallaudet graduates for our program! Speaking of hiring, are you using the resources available to you through CASE and CEC? Be sure to visit both the CASE Career Center and the CEC Career Center. I always think of myself as a teacher first and I bet you still do, too! So, I want to specifically tell you YOU ARE APPRECIATED as we celebrate this Teacher Appreciation Week! Thank you for all the midnight oil you burn, all the tears you shed, all the extra chocolate you eat, the extra caffeine you drink, but most of all, thanks for all the DIFFERENCE you make in the lives of so many!! So don't forget, the nomination forms must be in by June 15! Saturday school, also known as Saturday detention, is a strategy that can be used to reduce exclusionary discipline. Saturday school is an alternative to exclusionary discipline that requires students to go to school for a portion of their weekend due to their misbehavior in school. The advantage of this strategy is that it does not interfere with students' learning time while in school, but allows for additional time in school for extra instruction or assignments. Some Saturday schools may also require students to participate in physical tasks (e.g., picking up trash or yard work) or counseling. Additionally, because it is not during school, students will not see this as a way to escape from class. School districts have reported promising results indicating that they have seen a decrease in suspension and absences after implementing Saturday school. Say it loudly and wear it proudly! If your title is Special Educator because Awesome, Differentiating, Behavior-Changing Ninja is too long for your résumé, you can tell it to the world with the popular new CEC T-shirt that debuted at CEC 2016 in St. Louis! They're going fast, so don't miss your chance to show your pride in your profession and have a little fun, too! Ninjas, order your t-shirt today! CEC's Special Education Legislative Summit registration open! On April 21st, the U.S. Department of Education came together with the White House and numerous public and private partners to announce our shared commitment to improving Science, Technology, Engineering, and Math (STEM) education in early learning (Preschool – 3rd Grade). Early engagement in STEM is critical for our youngest learners because opportunity gaps in STEM can begin prior to preschool—and they can continue grow as students progress through school. There are a host of ways that the public and private sectors can partner to better address this STEM opportunity gap in early learning, such as integrating STEM with the arts and literacy, and using education technologies including screen media (e.g., television, computers, videogames, tablets). We believe that the use of technology can be an important tool for closing these gaps when used intentionally and appropriately in conjunction with other forms of pedagogy. Read more and leave a comment. Please submit your comments and questions in this open forum by 5:00 p.m. ET on Friday, May 13. 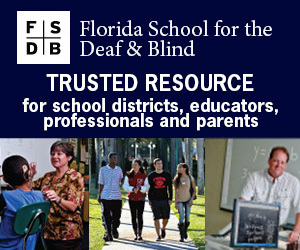 Summary: The Assistant Secretary for Special Education and Rehabilitative Services announces a priority under the Training of Interpreters for Individuals Who Are Deaf or Hard of Hearing and Individuals Who Are Deaf-Blind program. The Assistant Secretary may use this priority for competitions in fiscal year 2016 and later years. We take this action to provide training and technical assistance to better prepare novice interpreters to become highly qualified nationally certified sign language interpreters. In addition to your general comments and recommended clarifications, we seek input on the proposed design of the Experiential Learning Model Demonstration Center for Novice Interpreters and Baccalaureate Degree ASL-English Interpretation Programs (Center) and expectations for implementation. Deadlines: We must receive your comments on or before May 9. Type: Proposed Priorities, Requirements and Definitions. Summary: The Assistant Secretary for Special Education and Rehabilitative Services proposes priorities, requirements, and definitions under the Disability Innovation Fund (DIF) program. The Assistant Secretary may use these priorities, requirements, and definitions for competitions in fiscal year (FY) 2016 and later years. The Assistant Secretary takes this action to identify, develop, implement, and evaluate effective work-based learning models that will help students with disabilities prepare for postsecondary education and competitive integrated employment. The models must be delivered through a coordinated system of transition services. Deadlines: We must receive your comments on or before May 13.